Rails-to-Trails Conservancy (RTC) sojourns are unforgettable adventures on some of America’s most spectacular rail-trails. Sojourns explore the majestic landscapes, charming communities and iconic sites of their host states in a truly immersive and exhilarating way: by bicycle. For riders of all ages and skill levels—from the young to the young at heart, aficionados to first-timers, families to freewheelers—these tours are where memories and bonds are made. Learn more about the 2018 Sojourn. Plus, sojourns are so much more than great rides! They’re powerful “trail-building tools” that highlight the tremendous impact of long-distance trail routes and connected networks. Each ride—and every rider—make a difference. 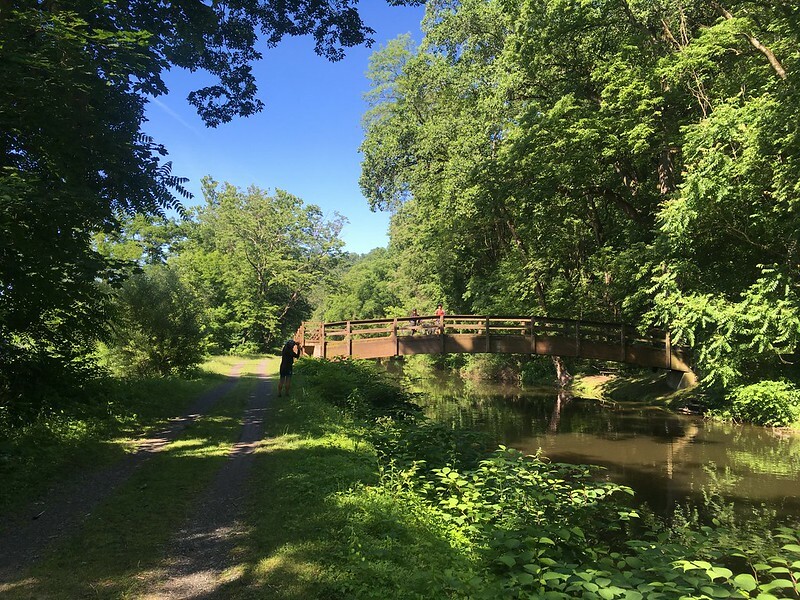 In June 2018, Rails-to-Trails Conservancy was honored to bring together 300 riders from 33 states on our 2018 Pennsylvania Sojourn to explore the exceptional D&L Trail. Over five days, we biked more than 160 miles, visited trailside communities, experienced the unique cultural and natural heritage of the region, and made new friends and everlasting memories. You will begin your five-day adventure in Easton, Pennsylvania, at Hugh Moore Park, the designated parking point for the sojourn. From there, you’ll be transported to a location near the quaint mountainside community of Glen Summit to begin your journey on the D&L Trail. You’ll bike 35 miles southeast along the rushing Lehigh River until you reach our first campsite in the town of Jim Thorpe, named after the Olympian and Native American sports legend. Your morning will have a spectacular and jubilant start as we join the community in celebrating the opening of the new Jim Thorpe Bridge! Energized by the Olympic-sized bridge festivities, we will then tackle our longest ride day—approximately 48 miles—through the picturesque Pennsylvania wilderness to Hugh Moore Park in Easton to camp for the night. Beginning at the confluence of the Lehigh and Delaware rivers in Hugh Moore Park, you’ll go back in time on this 38-mile ride day as you travel south along the trail and then cross over to the New Jersey side on the historic Delaware & Raritan Trail section. You’ll then reach our campsite in iconic Washington Crossing State Park, the southernmost point of our trip. In the heritage hotspot of Washington Crossing, you’ll have the option to enjoy one of our planned excursions—or spend the day relaxing at camp or exploring on your own around town—during a layover day! After a day of recharging in Washington Crossing, you’ll travel 37 miles north along the Pennsylvania side of the trail to end your exciting journey back in Easton with a “bon voyage” lunch. Since 2001, RTC’s annual sojourns have guided thousands of riders from all over America along the most scenic trail networks in Pennsylvania, West Virginia, Maryland, New Jersey and New York … and the list continues to grow. Through these premier rides, participants experience amazing trailside sights, communities and attractions—all while helping to make the case for building and connecting trails nationwide! Sojourns are designed to celebrate open trails and draw attention to gaps in would-be trail systems. Riders see, firsthand, the incredible impact of trails on the communities they touch. They also gain an understanding of the transformative power that, if completed, trail systems can have on the local region’s economy, health, environment and much more. By truly experiencing the transformative power of trails, sojourners become some of their mightiest champions and best stewards. The 2017 Sojourn explored western Pennsylvania by trail. The iconic Great Allegheny Passage and Montour Trail allowed our group to explore Meyersdale, Confluence, West Newton, Cecil, and the other historic steel and coal communities they connected. The 2016 West Virginia Sojourn followed the North Bend Rail Trail through North Bend State Park to Salem in Harrison County to Parkersburg. The goal was to highlight the existing trails and the need to upgrade or connect them to draw even more cycling enthusiasts in the future. The 2016 Florida Sojourn rode through Southern Florida on the Rickenbacker Trail, M-Path (also known locally as The Underline), South Dade Trail Southern Glades Trail, Black Creek Trail, Southern Glades Trail, and Biscayne-Everglades Greenway. RTC’s 2016 Pennsylvania Rail-Trail Sojourn was a breathtaking 110-mile bike trip westward along the historic Great Allegheny Passage. The three-day bike ride went through the hills of western Pennsylvania full of scenic woods and rushing waterfalls, lofty trestles and surreal tunnels, wide rivers and old coal towns. Centered in Morgantown (home to West Virginia University), the sojourn demonstrated how completing key gaps between the burgeoning Mon River Trails system and other rail-trails in West Virginia and Pennsylvania could result in 180 miles of trail that unite with another famous trail system, the Great Allegheny Passage, creating an unparalleled three-state network (Maryland, Pennsylvania and West Virginia)! The 2015 Pennsylvania Sojourn explored one of the most inspiring trail systems in the country, the Great Allegheny Passage (GAP). Riders also learned about an incredible trail in development, the Sheepskin Trail, which will connect the GAP to communities around the region and become an integral component to this world-class trail network. The 2014 Sojourn brought together 300 riders on a 191-mile, six day trip on three renowned rail-trails: the Panhandle Trail, the Montour Trail and the Great Allegheny Passage. Riders were able to be a direct part of two projects: a groundbreaking for a section of the Montour Trail (with gold shovels and all!) and the Pinkerton Tunnel project, presented to the group during an evening session by Linda McKenna Boxx, president emeritus of the Alleghany Trail Alliance. My absolute favorite part of RTC’s 2014 Greenway Sojourn (June 22-27) was talking to many of my fellow 300 riders about their experiences as we made our way from just outside Wierton, W.V., to Cumberland, Md. Have questions about the Sojourn?